Butler women’s soccer player Julia Calvert with TopSoccer athletes. The program started in 2010. Photo courtesy of @ButlerWSoccer. But the day was not yet over for the Bulldogs. Roughly two hours later, after the Bud and Jackie Sellick Bowl had emptied, Butler was back on the field, but this time for a different reason. Amid the grind of a collegiate soccer season, the team still searches for opportunities to give back to the community through one of the best ways they know how: soccer. In 2010, the program began partnering with Indiana Soccer to form the Indiana Soccer TOPSoccer Academy. The program was formed with Special Olympics Indiana to provide an opportunity for exceptional athletes in the Indianapolis area to enjoy the game of soccer. Locally, in an effort to move the players out into the community more frequently, the Butler women’s soccer team expanded their partnership with Indiana Soccer and started a soccer camp designed for TopSoccer athletes to participate in. “For me, I think we originally did it because there was this hole in the community, and we needed to get our athletes out and more active, but what has transpired is we get so much more out of it,” Butler co-head coach Tari St. John said. The program hosts TopSoccer athletes on Sunday evenings at the Sellick Bowl, where the athletes participate in warm-ups, games and simplified drills with the Butler women’s soccer players. 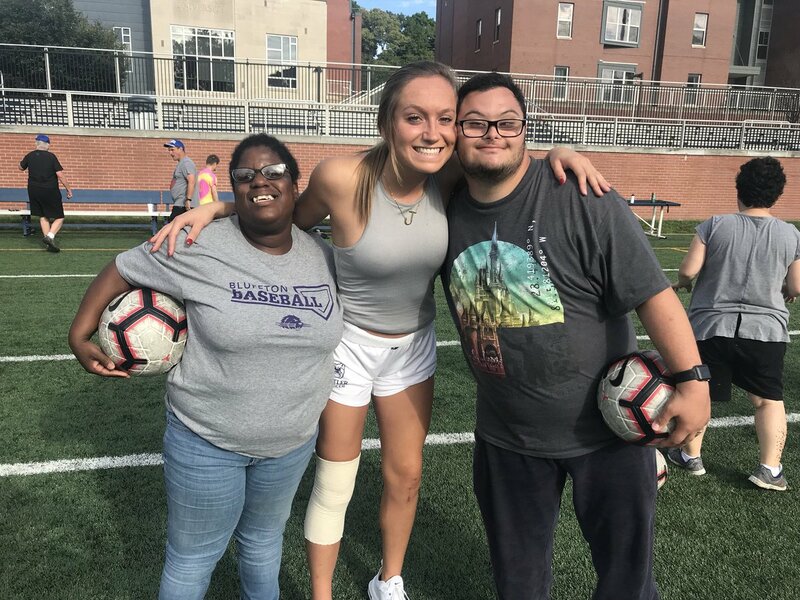 While the camp is aimed towards the TopSoccer participants, senior forward Paige Monaghan said she believes Butler women’s soccer players also see benefits from time spent with the athletes. For Goehring, participating in camp can also serve as a humbling reminder. For the women’s soccer program as a whole, the camp has become just as important as other facets of the program, and serves as a unifying aspect among players past and present. Soccer may be the initial focus for the camp, but what results, St. John said, is relationships and connections with the TopSoccer athletes through inclusion. At the end of the day, Monaghan hopes the participants walk away feeling better than they did before.